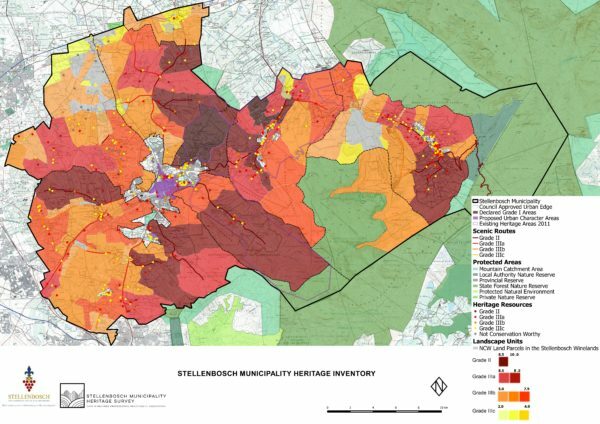 The inventory is an overview inventory for Stellenbosch, Franschhoek and the district. It was preceded by an earlier Heritage Inventory for the Stellenbosch town centre by the Stellenbosch Heritage Foundation. With these two surveys, a substantial part of the survey for Stellenbosch and district has now been completed. These now need to be reconciled with relevant information in the municipal database. Professor Fabio Todeschini and Liana Jansen led the work on the inventory. Among the professionals from various disciplines who contributed to the inventory are Dr Antonia Malan, Claire Abrahamse, Marike Franklin, Nicholas Wiltshire, Jenna Lavin and Shawn Johnstone. Read the fascinating historical overview by Dr Antonia Malan. Read the recommendations on pages 50-57 of the Phase 3 report. Explore the interactive overview map.